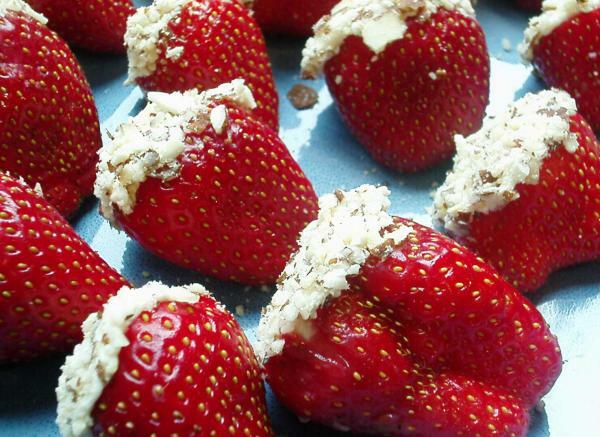 From Food.com and Linda's Busy Kitchen, we've modified her delicious cheesecake stuffed strawberries to make them even lower carb! ½ cup almonds, chopped fine in the blender, or LC-Almond Meal which is available in our store and is the equivalent of fine blended almonds in a blender without the mess. 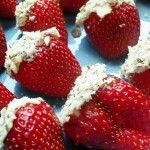 Place cream cheese in a bowl, and microwave for 30 seconds, so that it's soft. In the center of each strawberry, using a sharp knife, make a hole in each one, as deep as you can without going out the bottom. Spoon or pipe the filling into each hole. Dip cheesecake end of strawberry into chopped almonds, making sure you completely cover the cheesecake filling with the nuts. Lay strawberries in a pretty serving dish. Sprinkle with any leftover nuts around the dish.